On Aug. 24th, 2015, the Dow Jones Industrial Average experienced its largest intra-day drop (on a points basis) in history, terrifying inexperienced investors who haven't had much first-hand exposure to the ordinary sort of volatility that exists in the stock market. Coming at the tail end of a fantastic six-year bull market that represented one of the longest and most significant rises in the annals of both American and global commerce, investors in the United States who regularly dollar cost averaged, reinvested their dividends, intelligently diversified, and managed their affairs with prudence grew wealthier than many thought possible. They saw not only their unrealized capital gains expand with each passing year, but they also enjoyed staggering dividend hikes that turned already-rich initial dividend yields into truly lucrative payouts. It was, to put it bluntly, one of the most opportune, easiest times to get rich in generations. A lot of people did. This was especially true for the owners of the most royal of blue chips. Consider that over the most recent six or seven years, the big-name, mega-capitalization drivers of the stock market have produced cash dividend windfalls the likes of which have rarely been seen. Owners of Johnson & Johnson watched their per share payouts climb roughly 55%; Coca-Cola 61%; Clorox 64%; McDonald's 66%; Exxon Mobil 76%; Colgate-Palmolive 77%; Hershey 96%; Home Depot 162%. Starbucks, the world's largest coffee chain, went from paying no dividend at all to initiating one. Since the start of the measurement period, you'd have received roughly 25% of your entire cost basis back in the form of aggregate dividends you could redeploy elsewhere, spend, gift to charity, or do whatever else you wanted (this assumes you take the high and low price set that year and average them together, giving you neither a great nor terrible entry point relative to those that were available for the 52-week period). In addition to that beautiful fact, you'd now be collecting a cash yield-on-initial cost of 9.1% (if you adjust for the dividend "rebates", it's more than 12.2% on the net capital you've put into the stake). These aren't flukes nor outliers, they're indicative of the experience equity owners have had by investing in the stock market for much of the last decade. It's a tale as old as time. There's an old saying on Wall Street from a now-bygone era: "The stock market climbs a wall of worry." Through much hand-wringing, misery, anxiety, and fear brought on by headlines about everything from unemployment numbers to the national debt, corporate profits kept gushing. Those profits -- which are the foundation of the intrinsic value of each enterprise -- made their way into owners' hands, enriching them as billions of people around the world brushed their teeth, ate a chocolate bar, ordered a coffee, drank a soda, refueled their vehicle with gasoline, stopped for a cheeseburger, washed their clothes, or replaced their carpet. When you look back through history, stock market crashes of 33% or more, peak-to-trough, aren't terribly unique. When the Dow Jones Industrial Average hit a high of 18,351.40, you should have mentally thought, "Alright, anything between here and a drop down to 12,111.92 is business as usual; nothing special and, in fact, might statistically happen". If you had $500,000 in your combined retirement accounts, that would mean a paper loss in quoted value of $170,000, bringing you down to $330,000. Given your asset allocation is right and you aren't speculating heavily in individual securities, this shouldn't elicit more than a rough grunt of acknowledgment. It's simply not worth noting once you've been around the block any more than a rational person freaks out when a thunderstorm showers the Earth with water or an eclipse covers the sun. Billionaire Charlie Munger, the business partner of Warren Buffett for most of the past half-century, points out that he and Buffett have watched the quoted market value of their equity in Berkshire Hathaway, the holding company through which they conduct most of their business, fall by 50% or more, peak-to-trough, three different times in their careers, often with little to no change in the earning power of the underlying enterprise itself. Munger, who is known for his direct, no-nonsense delivery, thinks you're a fool if you let it worry you; if you find it disagreeable, you don't deserve the superior return equities produce over time and should be content to never use them as a mechanism to get rich or achieve financial independence. While that might come off a little harsh, he is correct in that you don't have to invest in stocks to build wealth. Benjamin Graham, Buffett's mentor and the father of security analysis, wrote about the way some investors irrationally prefer assets without liquidity, such as real estate, even when returns were inferior or identical because they didn't have to suffer the misery of knowing that someone else—another of their fellow owners—was making a mistake by selling for less than true, intrinsic value; in effect, how the same person who would laugh at a low-ball offer for a piece of farm machinery or an apartment building would pull his hair out or develop an ulcer if someone did the same for his fractional ownership in a great business. Humans are weird. Logic is not always the default way of looking at the world for most folks. Since 1950, the S&P 500 has had one-day declines of 3 percent or more nearly 100 times. It’s had two dozen days where it fell by 5 percent or more. Slow-motion crashes, where big declines are spread out over several trading days, are even more common. But every one of those declines has been followed by a rebound. Sometimes it comes right away. Sometimes it takes weeks or months. But when it comes, it comes quickly. If you wait until the rebound is clearly visible, you’ve already missed the biggest gains. What should you do if the recent correction does turn into a full-on stock market crash that lasts for years and takes half of your account value with it? The same thing owners of The Hershey Company did between 2005 and 2009 when the stock went from $67.40 to $30.30 per share: Focus on the underlying operations (if earnings and dividends keep rising, it should be fine in the end, especially as part of a diversified portfolio where failure in a component can be made up by unexpected success in another), buy more regularly, and reinvest the dividends. It might sound boring. It might be simple. It's the only way academically proven to make large amounts of money over time because you simply cannot time the stock market nor can you predict the next Apple or Google with any degree of certainty. That's it. Or, as I'm sometimes fond of saying: Buy great assets, pay reasonable prices, and sit on your [behind]. That's the recipe. Do it year after year, decade after decade, especially in a tax-efficient way with low turnover and expenses, and it's all but mathematically impossible not to end up rich over a 25 to 50 year period. If it ever fails, at least you'll have the consolation of knowing that nothing else matters, anyway, because America has fallen. Finally, if you find yourself breaking out in a cold sweat, seriously reevaluate your strategy and thought process. You're doing something wrong. If you're a do-it-yourself person and live near Vanguard's offices, consider paying them an extra 0.30% in annual fees to hold your hand and work with you on a strategy in person under their advisory program; to talk you down from the ledge when you mess up. If you don't or want a more tailored, high-touch approach (which generally requires a larger net worth), find a great bank trust department or independent registered investment advisor with a highly qualified portfolio manager you can trust and pay the 1% to 2% fee. 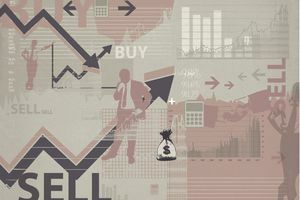 If you're still nervous about stock market crashes, you might want to consider changing your allocation to assets that better survive downtimes, such as a heavier mix of cash and bonds relative to stocks. Within the stock portion of your portfolio, dividend-paying stocks tend to fall less during bear markets due to something known as yield support. Alternatively, consider taking advantage of dividend reinvestment programs so you buy stock directly from companies and their transfer agents, get a physical check in the mail, and only have to worry about one thing while ignoring market price: Is the check getting bigger each year? Put together a portfolio of 25+ businesses over time using that method—the same method used by janitor Ronald Read when he amassed an $8,000,000 fortune on a near-minimum wage job—and it's easy to ignore the noise.